Tony McKinney, a Mainstream Home resident in Asheboro, lights up a room with his ear-to-ear smile and infectious personality. 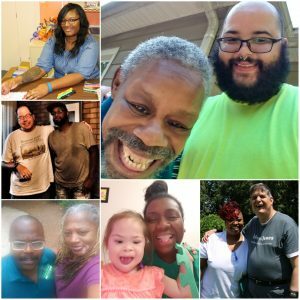 Monarch joins a nationwide celebration honoring the men and women who selflessly provide compassionate care for the people we support during Direct Support Professionals Week, Sept. 9 – 15. The week is celebrated annually and promoted by the American Network of Community Options and Resources and the U.S. Senate. A DSP’s main role is to help people including those with intellectual and developmental disabilities (I/DD) lead self-directed lives, provide assistance with daily living activities and serve to encourage community inclusion. In less formal terms, Monarch DSPs are the shoulder to lean on, the dependable, guiding hand or the supportive words of advice. Monarch currently employs over 1,000 DSPs across North Carolina, making up a significant sector of the organization’s total 1,800+ employees. The American Association of Intellectual and Developmental Disabilities estimates that by 2022, more than one million new DSPs will be necessary across the country to support those needing services. Heritage Club’s DSP Felicia Patrick defines her role as helping the person supported reach life goals and experiencing their journey with them. Patrick has supported Christie Cooper for the past four months and is pleased to witness her improvements. “Christie is not just someone I support at work. It’s not just a job to me. I love what I do, and I genuinely love and care for the people I support,” notes Patrick, who has worked in the DSP field for five years. Patrick knows well the important role that caring DSPs play because her son, who has cerebral palsy and is autistic, has benefitted from similar services. “The best part about my job is that I get to work with Christie and the other individuals at Heritage. I love seeing their growth and improvement,” she adds. DSPs often share in the excitement of the successes of the people supported. Carmel Forest Drive Home DSP Michelle Scales, who has worked as a DSP for 14 years, was thrilled when Brent Powell, her person supported, was extended a job opportunity in Charlotte. “It was exciting to watch him fill out applications, make phone calls and speak to managers about being a part of their team when we were out in the community,” Scales explains. Powell, who has been employed for the past eight months, is currently pursuing computer classes to enhance his skills, preparing for a promotion or additional employment opportunities, as well as working toward living independently. “My favorite part of being a DSP is assisting an individual with a disability to lead a self-directed life and become productive in the community,” Scales adds. The people we support oftentimes think of their DSPs as family. Cohen House DSP Rodney Barrino, who has worked in the field for 13 years, remembers an instance when he was sick forcing him to miss work. Josh Walker, his person supported, was concerned. “I got really sick and Josh and his mom called to check on me,” Barrino recalls. DSPs are also well-versed in being patient and noting improvement. DSP Tina Stroman of Pence Place in Richmond County believes changes in the person supported oftentimes appear slowly. Stroman recalls when her person supported, Esther Grady, first came to Pence Place she maintained little eye contact and was very quiet. DSP Deve Napper of CHOICES at the Ridge in Winston-Salem views her role as a gift and describes her bond with George Chamis as “unbreakable.” She has supported Chamis as his DSP for the past two years. Not only do the DSPs see growth in the people supported, but their experiences allow for their own personal and professional growth as well. “I got into this line of work expecting to help individuals grow, but I ended up growing with them. To me, this has been by far the most impactful job I’ve ever had,” Butler says of his DSP experience. Pictured from l to r: (top left) Felicia Patrick; (top right) Tony McKinney and Larry Butler; (left middle) Josh Walker and Rodney Barrino; (bottom left) Brent Powell and Michelle Scales; (bottom middle) Esther Grady and Tina Stroman; (bottom right) Deve Napper and George Chamis.